2016 is just a few days away, and many of you are probably busy shopping during the festive season going on right now. Some of you have asked me once again, like quite a few times, the best gaming laptop under Rs. 50,000. Well, it’s kinda tight budget if we consider high-end gaming, but yes we have got some pretty decent options out there. After the April Issue of Top 5 gaming laptop under Rs. 50,000 I’m back once again to solve all your doubts and provide some good choices for a gaming laptop that doesn’t hurt your budget. Before that, also I want to tell you guys that this time I will provide some fair choices as many of you complained that some laptops are available on only Amazon or only Flipkart, or retail price is too high, so i will try my best to pick the best ones which you can buy under this budget from any of the major e-commerce sites, however one of two of them may be unavailable on each and every store. So, let’s get started. This one is one of the best gaming laptops you can get with a great value for money. The laptop is powered by Intel Core i5 clocked 2.2 GHz with Turbo Boost upto 2.7 GHz, coupled with 4GB of RAM. However, you can expand the RAM upto 16GB which is great for people who do a lot of multitasking and play intense games. The laptop has a beautiful LED Anti-Glare full HD display. There is a 1TB SATA HDD for all your storage needs, regarding gaming the laptop comes with a powerful Nvidia GeForce GT940M with 2GB of dedicated graphics memory which is ample for moderate and pretty high-end gaming, however there will be some frame drops here and there when you play ultra high-end games in full graphics. Along with powerful specs, the laptop will also come with one year of Accidental Damage Protection which is a great thing, if you are a rough user. 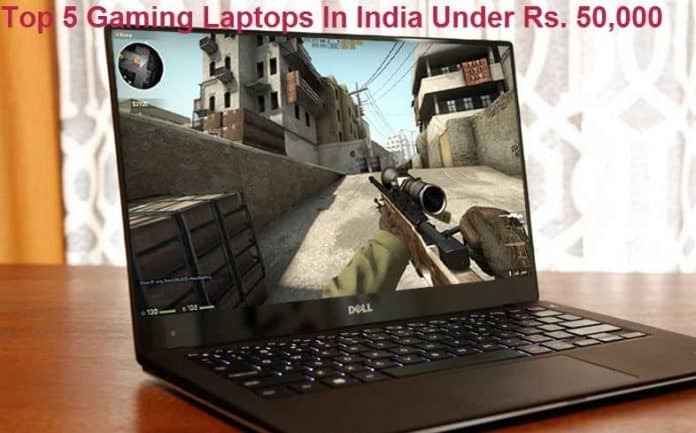 This laptop is available at around Rs. 47,000, so it’s an allrounder and I had to keep it on top of our list of Top 5 gaming laptops under Rs. 50,000. The 2nd one in our list of Top 5 gaming laptops is the Lenovo U41-70, which is powered by Intel Core i5 clocked at 2.2 GHz with Turbo Boost upto 2.7 GHz, coupled with 4GB of RAM, however unlike the HP ab031Tx, you can expand RAM upto 8GB only. It has got a mammoth 1TB SATA HDD along with a Solid Stated Drive having a capacity of 8GB. The laptop houses an Nvidia GT920M GPU with 2GB of dedicated graphics memory and it comes with Windows 8.1 out of the box. The frim claims that the 3 cell battery is capable of powring the laptop for upto 6 hours, however as I have experienced it could manage just around 2 hours during intense gaming, apart from that there is no issue to complain about. This laptop is available fro around Rs. 50,000. This laptop shares similar specifications with the one I have mentioned on top. The laptop is powered by Intel Core i5 clocked 2.2 GHz with Turbo Boost upto 2.7 GHz, coupled with 4GB of RAM, which is expandable upto 16GB. In terms of storage, there is a 1TB SATA HDD. The laptop houses a powerful Nvidia GeForce GT940M GPU with 2GB of dedicated graphics memory. The laptop comes with Windows 8.1 out of the box, just one thing I spotted that this one doesn’t come with ADP (Accidental Damage Protection), however the pricing made me drop it down to 3rd position in the list of top 5 gaming laptops, instead of the Lenovo U41-70. It costs between Rs. 48,000 to Rs. 50,000. So, that was our last issue of the year regarding the Top 5 gaming laptops that you can buy if you have a budget of Rs. 50,000. Hope, this quick guide will help you choose from the best ones out in the market and that too with different pricing options and e-commerce sites, along with some exciting cashback offers from Paytm. Also, you can check out some other exciting offers in the Big Electronics Sale going on right now at Paytm.